Explore all the walk and float fishing sections of the Madison River from Yellowstone Park to Ennis Lake. The Madison is regarded as one of the greatest freestone trout fishing rivers in the world and the lessons you learn in this video will help you catch the wild brown and rainbow trout that abound here. This comprehensive production will give you a grasp on the nature of the river and how to fish it. You will be able to visualize what awaits you and construct an angling plan that will makeyour Madison River adventure the most it can be. 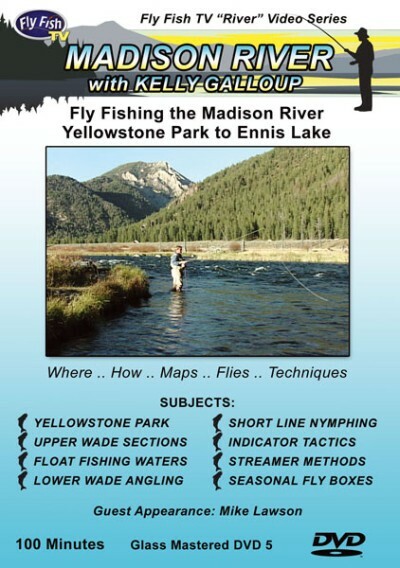 Kelly Galloup knows the Madison and will show you an "all around" selection of patterns that will work throughout the course of the river and its' seasons. 100 minutes in length. Another great Fly Fish TV video on DVD!